This new three-CD set is a classy thing. It includes three full albums from Peter Banks (arguably best known for his time in both Yes and Flash). These three albums are all instrumental and all classy. Each CD is one album, and this also includes a nice booklet with the covers and liner notes to all three albums. I think at least one (and perhaps all) of these are out of print now as separate discs. If the fact that this is value-priced and contains all three didn't get you, that fact should. I highly recommend this for fans of guitar based instrumental music, and particularly anyone who liked Banks in his various bands (he was also in The Syn, Mabel Greer's Toyshop and Peter Banks' Empire). I have reviewed each of these discs independently and then drawn those reviews all together here for this box set review. This album from Peter Banks is perhaps not his strongest solo set. That said, it has some very strong material. At times it seems to lack direction and get a bit on the wandering side. Still, there is a lot of great music here. I should note that this lands here under "Peter Banks," but it's actually credited as "Pete Banks." It fits under "Peter" here for two reasons. First, that's because it's how we have him listed in Music Street Journal. Secondly, it actually is listed as "Peter" on the box set I'm also reviewing in this issue (The Self-Contained Trilogy) of which this is one of three discs in the set. The sounds of someone walking around open this. Then, as you might imagine, we hear someone searching through radio channels. Mellow and rather ambient, this is a cool bit of ambience. There are bits of people talking about music. Here we get some strange sound effects and in-studio elements. This ends with some noisy guitar playing. This starts a bit tentatively but turns out to the most song-oriented piece here. It has some killer fusion elements at play. The cut has some cool changes and has some definite rock-oriented moments. It also gets into more dropped back, electronic styled things. I really dig the guitar work on this, but that is pretty much a given. There is a little radio snippet of two people talking about Yes. Then some moody, mellower music rises up to drive the piece forward. While pretty, there is a melancholy vibe to this cut. Some killer fusion drives this number. It has a good groove and works well. This short piece lands in the mellow end of the equation. It's a tasty number. The title track is intricate, mellow and pretty. With quite a few sound bites in the mix, this rises up with a cool rock meets fusion groove. This is energized and a lot of fun. It has some particularly soaring moments as it drives onward. There is really some powerhouse jamming as this evolves. The closing bit is such a cool rocking jam. Mellower music with nature sounds leads this piece into being. This develops and gets pretty involved, yet it still remains in the sedate zone. There is some killer guitar work built into it. There is a little piano before this glides into the next number. Another mellower cut, this has some tasty guitar work early in the number to lead it off nicely. This is really pretty and has a great flow to it. It has some great fusion as it grows upward. There are some sounds of nature at the start of this. Then a weird electronic prog groove is heard. Tribal percussion rises up as this works forward. Sound clips are a big part of this cut. It has a real world music meets funk kind of vibe to it. This gets really intense as the guitar drives it upward as it moves forward. It becomes a real screamer. With sound bites at the start, this works out to some cool rocking stuff from there. The guitar soloing on this thing gets pretty darned intense as it drives forward. There are some voices on this, but they are loops. That's when the song drops way down to continue. A mellower cut this is quite pretty and works well. It has suitably Greek oriented music elements at play. This is another cool instrumental piece. It feels a bit like an extension of the last one. Then again they are both movements of the same piece. Coming in energized and more rocking, this is killer stuff. It really has some great musical elements at play. There are definite fusion elements in the mix. A mellower piece, this seems to come out of the last one. It has some shifts and changes as it works through. This gets into some noisier territory while still remaining reasonably understated. This is a strange bit of fusion that has some killer guitar work. Built on a real rocking groove, this is classy stuff. . This mellower piece is quite pretty. 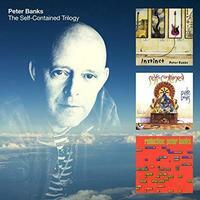 This is the third (and final) album included in the new box set from Peter Banks titled "The Self-Contained Trilogy." This instrumental album is classy. 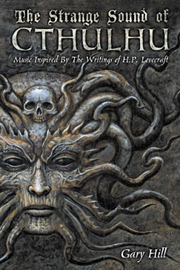 I've reviewed both as an individual disc and as part of that box set, using this same review. Like the other discs in the trilogy, this one uses sound bites, but probably not to the same degree as the other two did. This one leans more toward the mellow and fusion end of the spectrum perhaps. It's also the shortest of the three, but that's not a bad thing. All in all, this is a solid instrumental album that stands as a lasting tribute to Banks' art. There is an introduction to a live audience of the Peter Banks band. Then some weird effects and electronics take over from there. It's nearly a minute in before any real music shows up. Even then it's sort of atmospheric and textural. Odd sound bites and other things are in the mix. The full effect is sort of a Synergy does Pink Floyd kind of thing. This runs into the next cut. Coming out of the previous one, the music elements start to grow outward with a bit of a King Crimson turned funky approach. Still, it's rather understated in a lot of ways. This gets pretty fusion like as it continues. The intensity really builds, and there is some exceptional guitar work here. Coming out of the previous number, this has a killer funky groove to it. It's another killer fusion jam. There is a surf-guitar section as it approaches the mid-track point. It works back out to more of the powered up fusion sounds. It eventually drops back down for a bit of a noisy closing bit. This comes in mellower and quite intricate and pretty. It grows outward by building upon that musical concept. Here we have a killer rocking tune. This has some of that surf sound in the mix, too. It's a cool number with good energy and classy jamming. It definitely has a retro texture to it in a lot of ways. Textural sounds bring this into being, and it gradually rises from there. This in some ways feels like an extension of the previous cut. It's quite intricate and very mellow. A smoking hot rocker, this thing is so cool. Banks' guitar work is (of course) impeccable. He is screaming hot. This is mellow, intricate and pretty. It ends with bird sounds after the announcement that, "I'm going to let the bird out." There is a techno kind of groove to this in some ways. The tune gets into more of a rock meets fusion jam from there. There is some particularly cool guitar soloing on this number. I love the mellow musical motif that makes up the first part of this classy number. Banks' guitar work is of course precisely on-point. This is over nine-minutes long, though, so it works forward. It works out to some pretty intense and exploratory fusion after a time. It gets back into the mellow zone before it ends.